Harston School Roll of Honour is an honour book in a case which commemorates past scholars of the school who served in World War One. 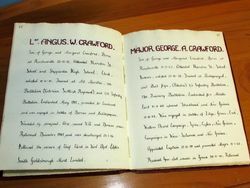 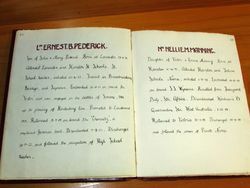 The book contains hand-written detailed entries of each former pupil's military and civilian record. 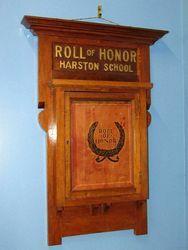 A large crowd gathered at Harston State School to witness the unveiling of an honor book and case erected to commemorate the deeds of past scholars who served in the great war. 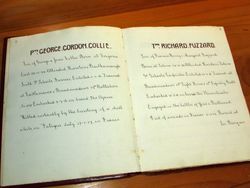 Mr. G. Crawford (president of the school committee), in a few well-chosen words, stated the reason for the function, and extended a hearty welcome to all present. 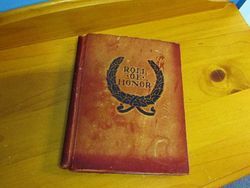 He also welcomed all returned men, and especially those whose names were inscribed in the book.